The best way to get to know Joburg is to hang out with an insider. In our Ask a Local series we chat to our favourite Joburg city people to get the lowdown on what makes the place unique. 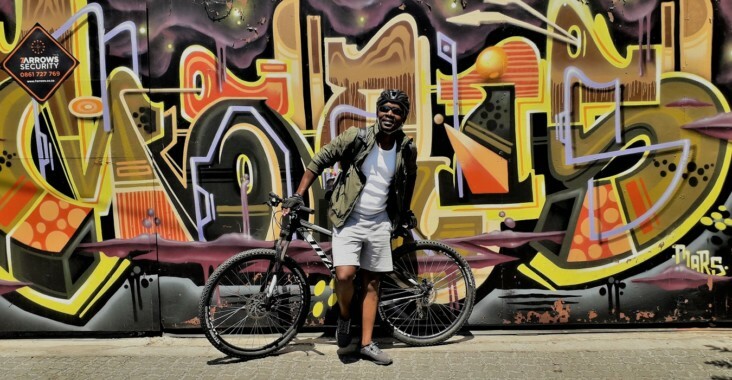 This week KENNEDY TEMBO shares his views on Joburg with us. One of the most energetic tour guides in Joburg, Kennedy Tembo is passionate about showing off Joburg’s gems and through his own tour guiding service, Microadventure Tours, takes locals and visitors out on adventurous cycling tours of downtown Joburg and the Cradle of Humankind, as well as leading guided visits to opulent Joburg heritage buildings and adrenaline-pumping hiking tours of the Magliesberg and the Drakensberg mountains. A keen hiker, cyclist and nature lover, after challenging himself to train up and run the 90km ultra-marathon Comrades to raise money for a local orphanage, Kennedy eventually quit his corporate job in IT to pursue his dream of starting his own tour company dedicated to showing off the sites of historic Joburg in new, energetic ways. A fitness fanatic who has finished Ironman once and Comrades five times, Kennedy pioneered Dlala Nje’s Ponte Challenge (a race to the top of the more than 900 stairs in the 50 storey Ponte building) and when not leading tours Kennedy can also be found heading up volunteer clean-up hikes through The Wilds park in Houghton and encouraging runners to tackle the historic Westcliff Steps every Saturday morning. I came to Joburg for university and the opportunities that the city presents. What makes me stay, is its cosmopolitan make-up and its warm people. Parktown. 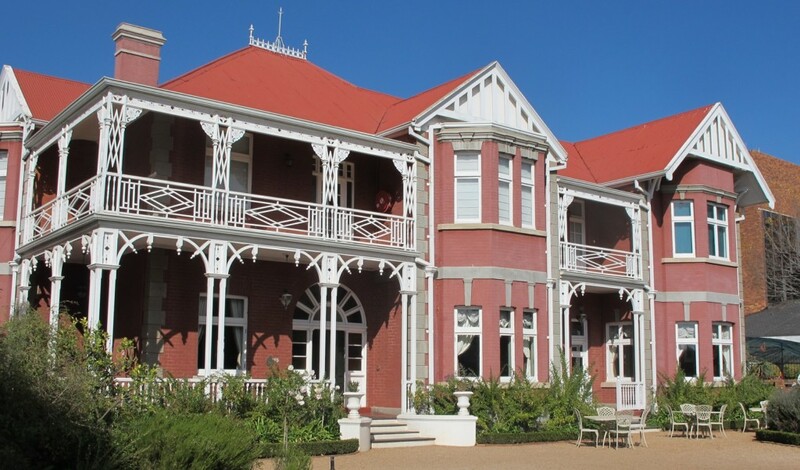 It’s full of history, especially the lovely architecture of the houses which once belonged to the Randlords (wealthy mining magnates) of the bygone Joburg. Bambanani in Melville because it is a family restaurant that you can take the kids to. It has a kids play area and a varied kids’ menu. Favourite place to shop? Rosebank Mall. It’s close to home. I spend my quiet time at The View in Parktown. Built in 1897 for Thomas Cullinan (who the Cullinan diamond is named after) it is one of the oldest houses in Joburg and also has a chilled pub. The Wilds. I love nature and The Wilds presents the opportunity of being in the wild and yet also still in the city. It’s peaceful and calming, and I find my centre when I am there. That it’s rich with architecture spanning eras from Neo-classical, Neo-Baroque, Art Nouveau and Art Deco to Modernism. Joburg’s architectural side has not really been appreciated or showcased enough. 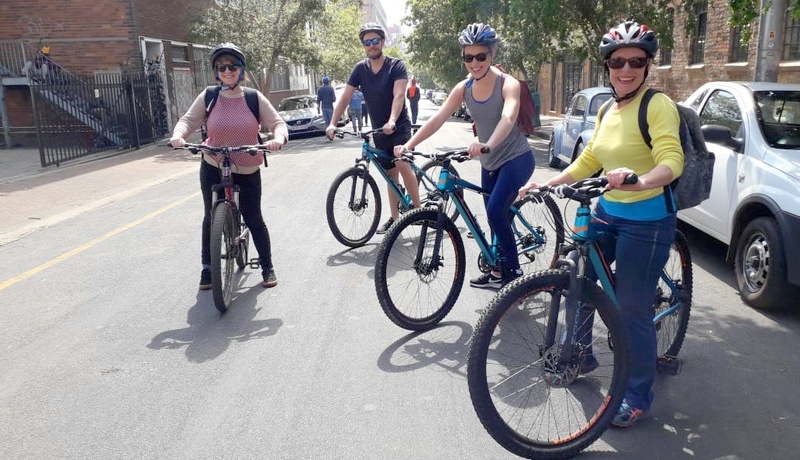 Visit Constitution Hill, visit Soweto and do a Microadventure Tours coffee cycle ride through Joburg with me! Joburg person I admire: I think James Delaney is one of my favourite Joburgers for all the work he has done in revitalizing The Wilds. On weekends you’ll find me …. Taking people around Joburg and if not in Joburg, I am in the Drakensberg mountains hiking. Best things about Joburg: Its heartbeat; the friendly people. Worst things about Joburg: The litter. Top tip for a first-time visitor to Joburg: As you would in any other big city in the world, be vigilant. If you didn’t live in Joburg where would you like to live? Anywhere close to the Drakensberg mountains which I love to bits! Three words that describe this city …. Cosmopolitan, Friendly and Hip! Visit microadventuretours.co.za to find out more about Kennedy’s tours and call +27 083 772 4678 or email info@microadventuretours.co.za to book a tour. Follow Kennedy’s tours and other adventures around the city on Facebook, Instagram or Twitter.